Germany's voxeljet is one of the world's leading producers of industrial additive manufacturing systems. While not a household name like 3D Systems or Stratasys, voxeljet's dedication to large format AM production has made the company a player in a number of industries. Though the VX1000 is capable of producing high-quality plastic parts, its sand molds are what distinguish it from other AM systems. The advent of silica sand additive manufacturing has made the production of short run, complex parts a much more cost effective reality for many firms. In addition to traditional AM applications like automotive and aerospace, voxeljet's technology is versatile enough to play a role in architectural modelling and fine art production. 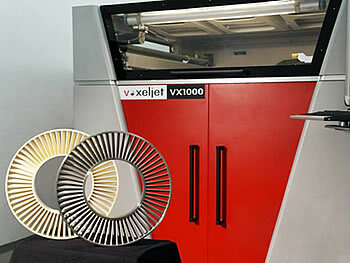 Central to voxeljet's versatility has been the launch of its VX1000 system. Offering the best blend of build volume, price and size to date, the VX1000 is capable of processing PMMA plastic and silica sand through its 10,624 nozzle print head. Given the density of nozzles built into the VX1000's print head, the machine can build models with a 600 DPI resolution. The VX1000 occupies 2.4 x 2.8 x 2.0 meters (8.2 x 9.2 x 6.6 ft) of floor space and weighs in at 3,500kg (7716.2 lbs). However, a complete VX1000 system is much larger. Altogether, a VX1000 system can come equipped with a materials preparation system, the VX1000, an unpacking station and a finishing cabin. If the full system were to be deployed, voxeljet recommends dedicated shop space of 8.5 x 7.5 x 4.4 meters (27.9 x 24.6 x 14.4 ft). To create its models the VX1000 builds objects layer by layer using a method that is similar to laser sintering. Once a CAD model has been transferred to the printer, the machine spreads a layer of either plastic or silica sand powder evenly across the build platform. Once the build platform is covered, the VX1000's print head moves over the settled powder, selectively adding material binder to the region of powder that corresponds with the model's layer geometry. After the print head has passed over the entire build area, the print bed is lowered and the process repeats until the model has been completed. The completed model can be removed from the VX1000 by extracting excess powder via vacuum and brush until the part has been excavated from its surrounding material. The completed model can be used as a functional prototype, a product demonstrator or sent directly to a foundry for casting. SAND material description: voxeljet's silica sand is an effective material for producing cast models for a number of reasons. First, the silica sand has a standard 200µm layer thickness making prints built from the material as consistent with their CAD model as possible. Additionally, the silica material is castable with all alloys, is environmentally friendly and comes ready to use without any preprocessing. Koncast is an industrial firm specializing in automotive parts. Their engineers found the VX1000 to be the right tool to cast a prototype aluminum clutch. Measuring in at 465 x 390 x 175 mm (18.3 x 15.4 x 6.9 in), the 7.6 kg (16.8 lb) clutch was produced using an especially fine GS09 sand. Thanks to this extremely fine granularity, each layer of the clutch was produced with exacting fidelity, making both the interior and exterior surfaces of the prototype true to the CAD model. Koncast's team created their clutch from the sand mold using a G-AlSi8Cu3 alloy and applied a steel ball blasting treatment to finish the design. Once the post-processing treatment was applied Koncast's engineers noted that the AM clutch was virtually identical to its production form, keeping the required tolerances. What's more, by using voxeljet's AM process Koncast realized sizable savings in time and cost due to the tool-less and automated nature of AM. While sand casting is the defacto standard for many industrial operations, voxeljet's ability to process plastic can also be an advantage. For The Schmolz + Bickenbach Guss Gruppe, the 1000's ability to produce lost wax molds from its PMMA plastic turned out to be the right solution to build a complex impeller. Traditionally, lost wax casting requires an expensive and time consuming procedure that employs injection molding tools, wax presses and heavy capital investments. When a short-run, complex part is in order, the cost and production time associated with traditional lost wax casting can be a non-starter for some clients. To eliminate much of the overhead and production time, Schmolz + Bickenbach created a PMMA plastic model of their impeller on a VX1000 system. After only a 1.8 hour print time, technicians at Schmolz + Bickenbach were able to begin preparing the model for investment casting. After a layer of ceramic material was applied to the print's exterior it was placed in a kiln for firing. During the firing process the mold was completely burnt out leaving no cracks in the newly produced ceramic die. After a cooling period, the die was cleaned with air pressure to remove any remaining plastic material. With that simple post-processing complete, the impeller was off to inspection where it was graded and immediately put into production. Within short order the new impeller was cast in steel, speeding up the total turnaround time enormously while also lending generous cost savings to the client. This project was actually printed on a VX4000, voxeljet's largest additive manufacturing system. Nonetheless, the execution of this project gives great insight into the quality and detail that can be achieved with the company's technology. Industrial manufacturers looking to reduce the cost of short run, complex parts will find that the VX1000 will satisfy their needs regardless of application. In addition, those looking to create high resolution, mid-sized models will also find that the VX1000 is up to the task. With its ability to process PMMA plastic the VX1000 can also be employed to make demonstration models for industrial designers and architects. For those who require models be built from well understood material that will behave consistently, the VX1000 is an excellent system. Beyond those uses, the VX1000 is arguably best employed by those who use investment or lost wax casting. With its unique sand and plastic materials the VX1000 can benefit those working with casting production techniques. The VX1000 was built for an industrial, capital intensive market. For those looking to make end use prints or functional prototypes other AM systems and print methods might be a better fit. Given that the VX1000's strong suit is casting, model production color and other aesthetic material attributes are lacking in the system. Mass-producers should shy away from the VX1000 as its strength is squarely in short-run, detailed components.